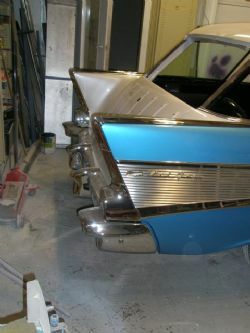 One of the most often heard phrases when building or restoring a classic car is “by the end of next week”. 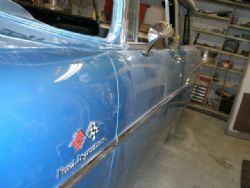 If I had ten dollars each time I have heard it during my years of classic car ownership I would now have a garage brimming with customs, rods and classics! I heard it again today from the guy doing the chrome. Interestingly, he also said it to me two and half weeks ago. I figure that if someone says that to me I will add three to four business days and if I still haven’t heard, which is normally the case, I will call to find out what is going on. You would think I should have learnt my lesson by now but I work on the principle that the squeaky wheel gets the oil. I need the chrome, especially the liftgate, to get things moving forward with the Nomad. The rear glass external mouldings need to be aligned with the liftgate as they may require massaging if the liftgate shape has been altered slightly through the chrome process. The same goes for the door interior top chrome mouldings as these will allow the new window felt, tracks and adjusters to be fitted and installed. The sad thing is you just have to wait. Patience was never a strong suite of mine. While I sit and twiddle my thumbs Brian and Joe have mounted a few more exterior bling bits. NOS fuel injection and cross flag emblems, exterior mirrors, aerial base and the rear bumper is now aligned and installed for the last time. On the inside the entire floor and back wagon shelf have received a coat of rust inhibitor and even though it will be totally covered by Dynamat it looks the goods. 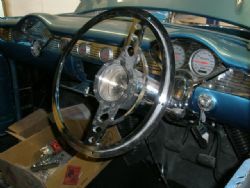 The dash has also been finalised with the full column, cover, turn and tilt levers installed along with all the gauges and billet inserts for the dash recess. 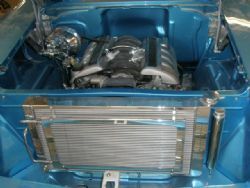 The Vintage Air main box has been installed on the interior firewall and the necessary ducting has been run to the outside of the bottom of the dash. A trip to a rubber specialist turned up a number of plugs that fitted neatly in the unused holes of the floor pan and finish it off with the added bonus of not letting water into the cabin.